I don't know if you guys have noticed, but I have my own domain name! My website now is www.eeshasglam.co.uk ! Wooo ! 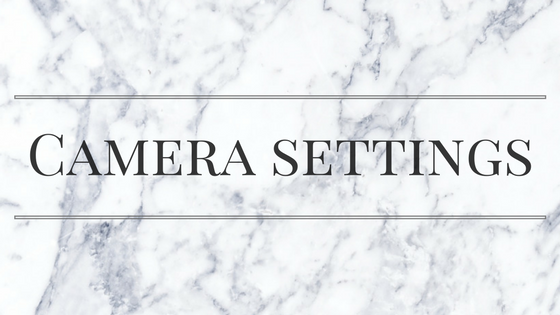 Ok excitement over, so now you have a camera and you want to know more about the settings? Great...lets begin! In this post, I will be talking about manual controls on a DSLR/Compact system/Advanced digital cameras such as shutter speed, aperture, ISO and RAW images. I will also write about pre digital camera settings. 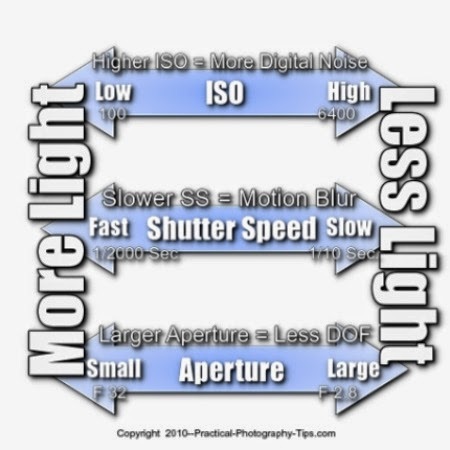 Shutter speed, aperture and ISO determines the exposure of the image so how light or how dark the image is. Mastering these three skills will lead you to take the perfect pictures. In basic word, shutter speed is the length of time the shutter stays open for. So a fast shutter speed means the less time the shutter will be open for, which can result in dark images as less light will be permitted to enter the camera and a slow shutter speed means the longer the shutter is open for, which will result in brighter images as there will be more time for light to enter the camera. Shutter speed influence on exposure is 1:1 so when exposure time doubles shutter speed time also doubles. 1/30th of a second is one of the slowest shutter speeds. When using a slow shutter speed it is recommended to use a tripod so there is less camera shake. A slow shutter speed is perfect to use for night time photography as it permits more light into the camera. 1/500th of a second shutter speed would be used if you wanted to freeze a moment such as sports event or action movements. At this speed the camera can be used hand held while taking the image as it is a fast process to take the picture. Shutter speed also can exaggerate the appearance of motion for example a slow shutter speed will blur water running from a tap and a fast shutter speed will catch each water drop! 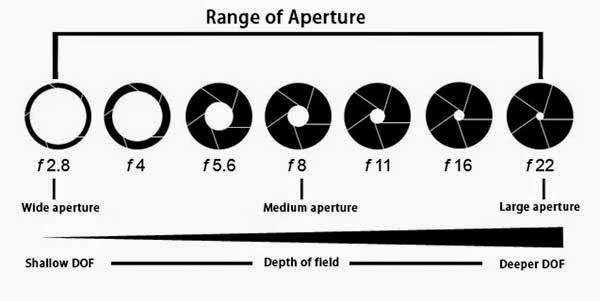 Aperture is measured at an f.stop value. Aperture is the opening of the lens where the light travels through. This picture clearly demonstrates what I will be saying. So an f2.8 is a wide aperture, this allows more light to go through as the lens is wide open, however this will result in a shallow/no depth of field. Depth of field is that blurriness in the background you see in some pictures to make the subject stand out better. If you want a deeper depth of field and want to blur out your background and just want the subject to be in focus and sharp then you will have to use a large aperture such as f22. However this will result in less light being able to go into the lens. So you will have to balance this out with a slow shutter speed to get a clear, brighter image. Shutter speed and aperture link in together so just make sure if you have a wide aperture, you try and have a balanced out fast shutter speed or else too much light will go into the camera and your image will be over exposed. If you want to use a large aperture, use a slow shutter speed so enough light can enter your camera otherwise this can lead to an under exposed image. I hope I am making sense? The ISO speed determines how sensitive the camera is to the light. A low ISO is always desirable and it is best to try and always keep it on its lowest and work with aperture and shutter speed instead. Low ISO means less noise where as a high ISO means there will be more noise and grain in the picture which we do not want! I normally keep my ISO at 200 but I try and not to go above 400 unless I have too. So the higher the ISO not only is there more grain but the image is also brighter as there is more light so a high ISO maybe needed during night time photography. A low ISO means the image will be darker however photographers usually try and sort this out by adjusting the shutter speed and aperture before increasing their ISO. We have all seen one of these attached to our cameras on top. I will now be explaining what each mode means. All digital cameras have one of these including DSLR's. These are pre settings which are already in the camera to help beginners. It gives you the confidence to take pictures if you do not want to start from manual. AUTO - The camera does the work for you here. It will automatically set all the exposure settings. M - Manual mode. 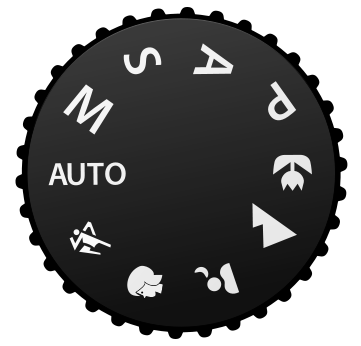 This is where you change the aperture, shutter speed and ISO settings. Everything is set by you and you decide what you want to do. A - Aperture Priority can also be shown as AV. This is where you specify the aperture and ISO and the camera decides a suitable shutter speed. P - Program mode. This is where the camera automatically chooses a shutter speed and aperture and you choose a suitable ISO speed. Macro mode (flower) - This is a setting you would use to take a close up of a subject. Landscape mode (Triangle shapes) - This is a setting you would use when you want to take picture os landscape. The camera will choose a large aperture for a large depth of field. Night/Low light mode - This is when the camera chooses a slow shutter speed to allow more light to enter the camera. It will also increase the ISO speed and if your camera has a flash it may also automatically trigger that. Portrait mode - This is when the camera will choose a low f.stop/aperture value to create a shallow depth of field. This also gives the illusion of a softer skin. Sports/Action mode - This is when the camera will choose a fast shutter speed so the camera can capture sharp picture of movements. So those are just the basics. If you have a DSLR, learn the shutter speed, aperture and ISO relationship and before you know it you will be taking those perfect pictures. If you have a digital camera, use the pre camera settings depending on what kind of picture you are taking. I would recommend starting of with shutter priority as you are only deciding on the aperture then and then slowing moving your way up to manual mode once you feel comfortable. However just experiment! Practicing is the best way to learn! These are really great tips, taking good images are so important for blogging. Thank you! And yup I totally agree!